Composer, teacher, violinist, and conductor Murray Adaskin spent over twenty years in Saskatchewan and was among the first Canadians to contribute to the growth of significant musical culture outside of Toronto and Montreal. He was born into an artistic family in Toronto on March 28, 1906; two brothers, Harry and John, were musicians and another, Gordon, was a painter. He studied violin with Harry, and then with Luigi von Kunits (Toronto), Kathleen Parlow (New York), and Marcel Chailley (Paris). 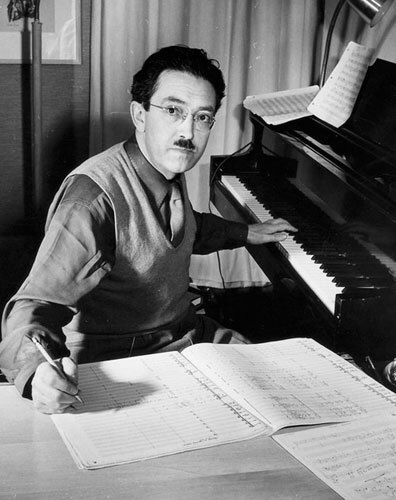 Initially active as an orchestral and chamber musician in Toronto (1923-36 with the Toronto Symphony Orchestra, and 1938-52 as a member of the Royal York Hotel Trio), by the mid-1940s Adaskin found his central interest shifting from performance to composition. To this end, he began studies with John Weinzweig, Darius Milhaud, and Charles Jones. In 1952, the Dean of Arts and Sciences at the University of Saskatchewan, J. Francis Leddy, recruited Adaskin to head a restructured Department of music. Since the university did not offer a degree in Music until 1967, his courses in composition and music appreciation were developed for non-music majors. In 1966, Adaskin left the chair of the Department of Music to become composer-in-residence, the first such position in Canada. As head, Adaskin played a pivotal role in arranging for the purchase by the university of a quartet of 17th-century Amati stringed instruments from Saskatchewan wheat farmer and amateur musician Steven Kolbinson. His orchestral piece Saskatchewan Legend, is dedicated to Dr. W.P. Thompson, President of the University of Saskatchewan from 1949 to 1959, and his wife. During his time at the university and afterwards, Adaskin adjudicated at music festivals throughout western Canada. Adaskin and his wife, soprano Frances James, were very involved in the Saskatoon musical and artistic communities. He conducted the Saskatoon Symphony Orchestra from 1957 to 1960, and initiated the practice of commissioning a new Canadian work annually. The first commission, in 1958, was given to Saskatchewan composer Robert Fleming. Adaskin was responsible for bringing a number of distinguished visitors to Saskatchewan, including Benjamin Britten and Peter Pears. In 1959, he organized a six-week Golden Jubilee Music Festival to mark the fiftieth anniversary of the opening of the University of Saskatchewan. For Canada's centennial, he mounted six Exhibition Concerts, each devoted to a single Canadian composer. After his retirement in 1973, Adaskin and his wife moved to Victoria, BC, where he was equally involved in the cultural life of the community. Although his free summers as a university professor had allowed him time annually to compose, retirement was especially conducive to his creative muse, and over half of his total compositional output of 131 pieces was written after leaving Saskatchewan. Adaskin wrote works for band, chamber ensembles, one or two instruments, and voice. He composed an Opera (Grant, Warden of the Plains, 1967), orchestral works, concertos for solo instruments and orchestra, numerous divertimenti and fanfares, and many educational works for beginning, intermediate, and advanced students. In addition to the many works that received their first performances in Saskatchewan, provincial organizations provided Adaskin with many commissions, including: Saskatchewan Legend (University of Saskatchewan Golden Jubilee Committee, 1959); Divertimento No. 3 for Violin, Horn in F, and Bassoon (University of Saskatchewan, Regina Campus, 1965); Divertimento No. 4 for Trumpet and Orchestra (Saskatoon Symphony Orchestra, 1970); Fanfare for Orchestra (official opening of the Saskatchewan Centre of the Arts, 1970); Divertimento No. 8 for Concert Band (Saskatchewan Music Educators' Association, 1986); and the String Quartet No. 2 (University of Saskatchewan, 1994). Adaskin's musical style is characterised by the manipulation of small rhythmic cells, clear but dissonant contrapuntal textures, and a lyrical, long melodic line that is expressive but never sentimental. The influence of mid-century neo-classicism is clearly discernible. Folk material makes an appearance in works such as Saskatchewan Legend and the Algonquin Symphony. Overall, his music tends to be optimistic and upbeat, a trait that many commentators link to his personality. Adaskin was a founder of the Canadian League of Composers, an associate of the Canadian Music Centre, and a member of the Canada Council between 1966 and 1969. He was named an Officer of the Order of Canada in 1980, and received the Lifetime Achievement Award for Excellence in the Arts from the Saskatchewan Arts Board in 1991. He was awarded honorary degrees from the universities of Lethbridge, Brandon, Windsor, Saskatchewan, Victoria, and Brock. For his 75th birthday, the University of Saskatchewan mounted an Adaskin Celebration in 1982. Six years later, the University of Victoria arranged a series of concerts of Adaskin's music, a conference on the arts in Canada, and an exhibition of the Adaskins' collection of Canadian painting - collectively entitled The Adaskin Years: A Celebration of Canada's Arts. The libraries of both the University of Regina and the University of Saskatchewan have complete collections of his musical scores; in addition, the latter holds several autograph manuscripts of early works. The National Library of Canada is the major repository of Adaskin's manuscripts and papers. Adaskin died on May 6, 2002. Lazarevich, G. and R. Cathcart. 2003. Murray Adaskin: An Annotated Catalogue of His Music - A Unison of Life, Music and the Man. Victoria, BC: Dolce.